In protoplanetary disks dust grains can grow into planetesimals, then rocky planets or planetary cores and sometimes gas-rich giant planets. Understanding this remarkable growth is an extremely challenging. Planet forming regions are typically enshrouded in dust and gas, obscuring the planet formation process. The large range of sizes and timescales makes first-principles numerical simulations impractical. Therefore, center members work to combine observations of planet forming regions, pen-and-paper analytical arguments and numerical simulations to improve our understanding of planet formation. Even after planets have formed, large number of small bodies can persist for hundreds of millions to billions of years. For example, our own solar system has reservoirs of small bodes in the asteroid belt (mostly between Mars and Jupiter), the Kuiper belt (just beyond Neptune) and the distant Oort cloud. 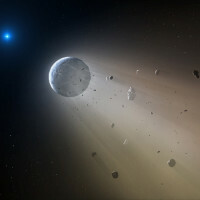 Observations of extrasolar debris disks provide information about the masses and orbits of their accompanying planets, and perhaps even the history of planet formation around that star. Rebekah Dawson studies the planetary sculpting of proto-planetary disks, debris disks, and the Kuiper belt. Eric Feigelson studies the impact of X-rays on the ionization state of planet-forming disks. Eric Ford is interested in the interaction of planets and disks, both during planet formation and the once planet formation has given way to planets clearing gaps and other features in a debris disk. Kevin Luhman uses infrared data from the James Webb Space Telescope, Spitzer Space Telescope, and the Wide-field Infared Survey Explorer to study circumstellar disks around young stars and brown dwarfs in nearby star-forming regions. Steinn Sigurdsson models the formation of planets and the accretion of volatile elements that form their atmospheres and oceans. List of links to research group webpages, etc.